Enterprise Architecture is too hung up on minutiae. Any new EA initiative will have catchphrases like standards, strategies, roadmaps, guidelines, models, IT-business alignment and so on flying around. One could be forgiven for thinking those components are the golden keys to EA’s success. They’re certainly important. But what good are they if nobody knows why they’re being adopted? Worse, what if nobody even knows they’re being adopted at all? 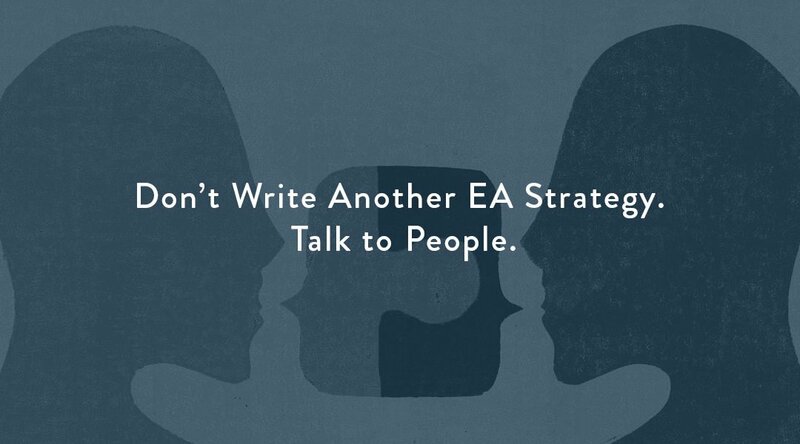 EA’s success depends far more on good old communication than a lot of organizations think. A great way to ensure EA never gains traction or jumpstarts any meaningful change is to bury it down the mineshaft of tedious reporting structures, far away from executive leadership who possess the influence to empower their efforts. Don’t make your EA feel like Whoville in Horton Hears a Who, the tiny city on a speck of dust atop a flower whose salvation from sudden and brutal annihilation was ultimately dependent on a lone citizen screaming at the top of his lungs. EA’s dependency on communication is no different than any other discipline or initiative trying to change the way people work. Want to adopt an Agile methodology? Communicate it. Want everyone to know they’ll be working in darkness after hours because saving electricity is now an environmental priority? Communicate it. A consistent cadence of communication isn’t the only way to gain visibility, but it is certainly one of the better ways. That said, merely maintaining consistent communication doesn’t automatically save your broader message from a direct route to the trash folder. People need a reason to pay attention, and that attention is better won through the right sponsorship. Think about how long people have been putting their money where celebrity mouths are. That’s the power of sponsorship. People notice something when someone who already has the benefit of their attention waves it in their face, whether it be tax software, snack food, or a message about water conservation. This is news to precisely no one. Change Management theory repackages this concept in the idea of executive sponsorship. Executives obviously already have everyone’s attention. A random email from “someone in EA” goes from uninteresting to important if its ideas have been echoed by someone with a degree of visibility and trust. EA’s relationship with executive leadership (or lack thereof) is crucial to its eventual success or failure. EA can be a major differentiator for your organization if it’s well-placed and its goals are well-communicated. Otherwise it’s just like an appendix*: something with a poorly understood purpose that most people expect they’ll just have to remove eventually.